BREAKING: New York Times op-ed columnist Ross Douthat is just like every girl you know who just moved to Williamsburg and is trying to make it in this big bad city. Why? 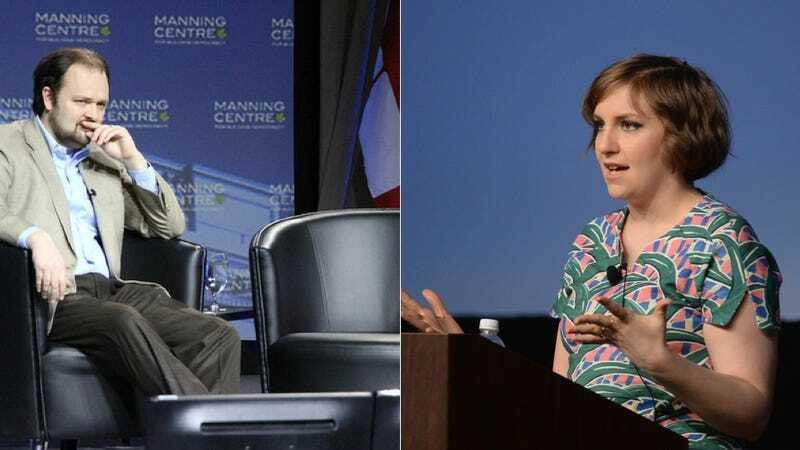 He positively LOOOOOOOOOOOVES Lena Dunham. In case you're already doubting the mostly-conservative Douthat's firm stance on this topic, his column in this Sunday's paper of record makes it clear: it's actually titled "I Love Lena." Despite the fact Douthat once waxed poetic on how he was so disgusted up with a "chunkier Reese Witherspoon" he hooked up with in college that he couldn't get it up, he loves it when Lena takes her clothes off on HBO. Ross Douthat has grown. There are moments — a messed-up daughter's encounter with her feckless dad, a character's rant against her close friends' self-absorption — that are almost puritanical (in a good way!) in their moral perspective. Puritanism. Ah yes. Ross and his coterie of conservatives who love Lena can do so because they live their life according to the principles of puritanism (in a good way!) and it reminds them of how much better they're doing things than everyone who is not them. That makes sense. World: continue turning.